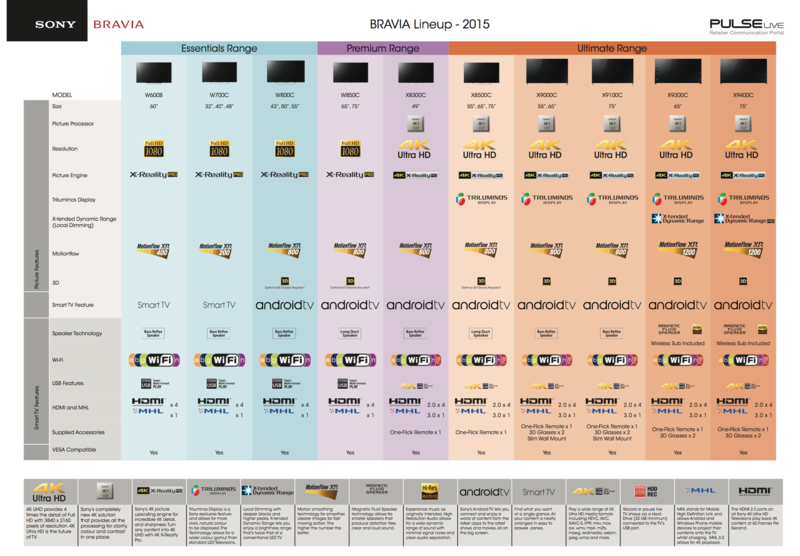 Last week, we reported on the launch of Sony’s Android TVs into Australia. This week, we have one in the Ausdroid office to play with, and my golly gosh… it truly is a glorious piece of technology. I apologise profusely in advance for not using photographs of the TV in situ, but our media centre is .. well .. a little untidy. However, the photograph above is the only one from Sony’s press kit; we’ve got some screenshots to show off the TV we’re looking at, below. So, what are we talking about here? Our review unit is a Sony KD-55X8500C, which for the rest of us, means its a 55″ 4K TV running Android TV. However, it isn’t like Android TV on the Nexus Player, because it has a couple of notable additions. As you’d expect, Sony’s TVs come with a number of HDMI inputs, for your Foxtel, Bluray players, Playstations, Xboxes and the like, and you can tune digital and analogue free-to-air channels as well. There’s built in support for Netflix, which runs a slightly customised version of the Netflix Android app designed for the TV format (it’s the same Netflix as you can get on the Nexus Player), as well as the standard array of Google services, such as Play Movies and TV, Play Music and YouTube. There’s an extra inclusion that’s going to drive Australian TV users berserk though, and it’s the inclusion of catch-up TV apps, which are part of the Freeview Plus suite. Since we’ve had Android TV, one of the most requested features has been for the Australian TV networks to release their catch-up apps for the platform, including iView, SBS On Demand, Plus7, TenPlay and others. However, none have released an Android TV app just yet … but for buyers of Sony Android TVs, this doesn’t matter one bit — Sony has the catch-up apps built right in to their Android TV platform, so you can use them now, before anyone else. As you can see in the screenshots above, all these catch-up apps are included in your Sony Android TV, and they all work perfectly. We’ve captured iView and On Demand, but we’ve tried Plus 7 and TenPlay as well, and they both work wonderfully. Perhaps the best inclusion though is Netflix, because on a 4K Android TV, you get access to Netflix’ Ultra HD catalog of programs and movies. That’s a rather small catalog. But its growing. Watching any Full HD program on the Sony TV is a sight to behold; we’ve been watching Dredd this afternoon, and it’s truly epic. I could barely tear myself away from it to do other things that need to be done, that’s how crisp and clear it is. For this, we can thank Sony’s upscaling technology, which readily takes 1080p Full HD content and upscales it to glorious Ultra HD 4K. There are some pictures that it struggles with; for example, it can’t do too much with standard definition digital broadcast television, but it certainly has a go. However, with FullHD content, Blurays and the like, the upscaler works incredibly well, making content truly beautiful to take in. Interstellar is one such movie which Sony like to use to demo their TVs, and its easy to see why. Those space scenes where Matthew McConaughey’s spacecraft is travelling past Saturn and its rings are just epic. If you’re on the lookout for a new TV, and you’re a fan of a true Smart TV experience (rather than some proprietary platform), a Sony powered Android TV is hard to go past. The delivery experience from Sony’s online store is seamless, taking only a day or two from order to delivery. Unboxing is an equally smooth process; from delivery to having the TV set up and functioning was about half an hour, and most of that was screwing the foot into the TV, and carefully lifting it into the media centre. Once the TV is connected to your network (via ethernet or WiFi; both are supported) the setup process is a breeze, and you can enjoy glorious, high res content from the comfort of your lounge. I’d write more … but I want to go watch some more delicious television. great picture. Worst software ever, crashes, doesn’t run some apps, badly designed and thought out guide, horrible navigation through menus, over all should be replaced ASAP. 28 sept install and netlfix likes to roll back to login page, got it on twice . Drops it with power off,wifi good signal. @disqus_U631XhjBP9:disqus Yes it is limited for Australian users and here you will have to use Netflix VPN for outside USA. Just get the best VPN for Netflix in this list and access from anywhere as this is the best way to access Netflix outside the USA in any region. I hope this will help you out must go for it. Go to VPNRANKS for List of VPN providers. Bought this TV today but can’t seem to get Netflix working? I keep getting cant connect message. you need to update the software. scroll down the home page and click on the “?” icon to find update option..
How do you access the normal TV channels, abc, 7,9,10 etc. Is it through a separate ‘AV’ input, or can you access from the Android TV menu. Sorry to spam you. Is your Netflix working? Mine is. Are you having issues? Have you tried using a dualschock4 controller? Thanks, I originally read that they are compatible, but I saw on the Sony FAQ page that they should work but are unsupported. I didn’t think the Xbox controllers used bluetooth, how are you connecting this? Does Stan have an app available? Not stand-alone on the TV, but Stan uses Chromecast protocol, so you can just cast it to the TV from your computer, phone or tablet. Works perfectly. I was hoping for the stand alone app. I’ve used the Chromecast app before and works quite well. Sounds like I’ll have to hit them up for a timeframe. There’s lots of standalone apps needed. Stan. Presto. 9 Jumpin. Foxtel Go. Perhaps before that, Sony need to fix some of the lag issues. I would suspect updating to 5.1 would help with that for them. Whenever they choose to do that. I asked them about this months ago. Well more so suggested in anticipation. It doesn’t sound like much work but we’ll probably be waiting until some time next year… If you get s tone grand please do let us know. I just bought the 50″ HD model. Have to wait until the end of next month to use when I move out though. Where did you get that idea from? I’m think it come with 4 HDMIs and 3 component. The entire range has 4x HDMI ports so should be ok. But I’ll buy one if my TV dies and its not a huge premium over a boring ‘TV’. I got one yesterday and have installed kodi on it. It’s awesome and works flawlessly. What I really want to know is how well the EPG and PVR features work in Android TV, which is just as big a deal as the catchup apps. Any chance you could offer some thoughts? Not sure if this TV has a PVR function in it; haven’t come across it yet. Can’t access EPG, because we don’t have an antenna installed. There is a PVR option in the specs list (http://ausdroid.net/wp-content/uploads/2015/07/Screen-Shot-2015-07-09-at-2.18.31-pm.png) which offers to record or pause Live TV on a connected USB device. Check that out. Looking at purchasing one tomorrow. Since you guys have one can you tell me if the catch up Aussie apps are accessed within Freeview Plus which looks like it’s included with these new android TVs? I cannot see the channel nine 9jumpin catch up app anywhere? Is this also included within the freeviewplus apps? 9’s JumpIn app does not appear to be present. ABC, SBS, 7 and 10’s apps are there though, and they work fine. Foxtel Play is neither installed nor available from what I can see. 2. On the 4K model, what is the quality of normal TV like ? And will normal TV look better, same or worse then the non-4K model ? 3. How fast it it to navigate around the menus ? 1. You can use Netflix via the remote or via the Android app. Up to you. 2. Normal TV is probably going to look 98% the same. The 4K upscaler does work on FTA TV, but depending on the quality of the image, it’s going to struggle to make it look like crisp sharp 4K. 3. Navigation is quite quick, same as a Nexus Player. I would like to get the Freeview app on my Nvidia Shield Console, for some reason it is not available from the Play Store but here it is on an Android TV device. Does anyone know if it is coming to the Play Store? I’m not sure whether the Freeview+ apps are actually Android; I suspect they’re not, which might explain why they aren’t on the Play Store yet. Thanks for he review guys. I have the same model. Did you guys manage to get the Netflix app working? Mine wouldn’t let me past the login screen 2 days ago. I haven’t tested again today though. Yeah, Chris has it working, he was enthusiastically raving about how good the 4K content on Netflix was looking. There’s a software update which improves Netflix; would suggest checking for this. Does it have dual tuner? For what purpose? It doesn’t record. I don’t believe it has a dual tuner. Dual tuner would be useful for picture in picture. Do we have a sense of price? This particular model is priced around $2900 depending on where you buy it. Is Netflix limited to Australian account or could I login to my VPN / US account? I suppose you could log in to a US account if you had a VPN set up. I don’t have one to try with. login in directly. mine is US and works fine. You can login to your Netflix account, but unless you change the DNS: http://ausdroid.net/howto/setup-nexus-player-custom-dns-side-load-apps/ you’ll only see the Australian selection of Netflix content. You can also choose to install SmartDNS at router level, or a VPN if your router allows it. Tested: Aussie Broadband NBN 150 Mbit down 100 Mbit up FTTP Speed · 48 mins ago.